I'm finally in that place as a sexist where I feel like I can crank something out if I want to. This week I did that to make my daughter a St. Patrick's Day themed saddle pad for a schooling show at her barn. There is a "Costume" class at the end of the show where the riders get to dress themselves (and their horses!) up for fun. I hate to admit it, but I bought the plaid fabric at Hobby Lobby...I knew it would get beat up, and got the fabric for a steal. I did however, decide to put some Annie's Soft & Stable in for the padding, which worked MUCH better than batting. I contemplated actual foam, but I couldn't find any thin enough that it wouldn't look bulky. The Annie's worked like a charm. Happy St. Patrick's Day! 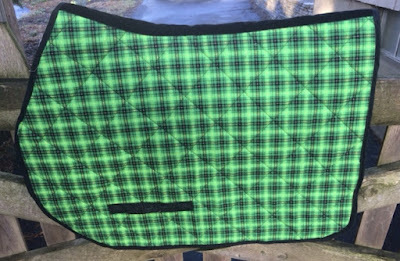 Hope this Saddle Pad is lucky! !